Who are the best fantasy football plays for building an optimal DFS lineup during the Conference Championship round for the 2018 NFL season? As we do every week, this piece brings you the DFS locks for the main slate. This piece will go over the players you can lock into your DFS lineups for optimal performance. Brees and the Saints have the highest implied total on the slate — and that’s saying something, considering both games are projected to be close-scoring games that produce at least 55 points. Of the four quarterbacks playing this weekend, Brees is the only one who has home/road splits in his favor. Those splits are well-documented, and Brees gets a Rams defense he carved up for 346 yards and four scores in Week 9. With Todd Gurley in a shocking timeshare, Kamara is the only running back we can safely project for over 20 fantasy points. 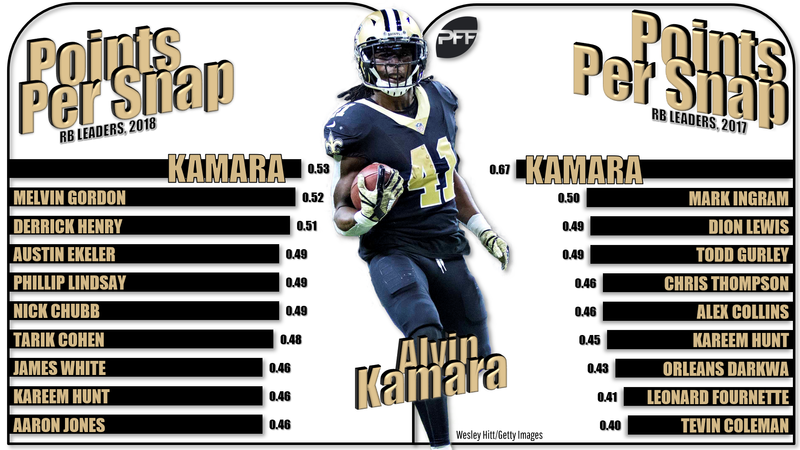 This season’s (and last season’s) leader in fantasy points per snap, Kamara draws a Rams defense that surrendered a generous 4.9 YPC to running backs this season. Kamara diced up this D for 116 total yards and three scores in Week 9. Williams is now expensive — he’s only $100 less than Kamara — but he’s been established as the top dog in Kansas City and will remain so even with Spencer Ware returns. Williams logged 30 touches in last week’s win over Indianapolis, while the Patriots ranked in the bottom-10 in fantasy points per touch allowed to running backs (from Weeks 1-16). Williams has over 100 yards from scrimmage in three of his last four and five total touchdowns in that span. Thomas’ well-known home/road splits were on display last week as he exploded with a 12-171-1 line. That’s a great game, obviously, but it was only a little better than his usual home game (9-110-0.77). Thomas should annihilate the Rams secondary, which allowed the third-most fantasy points per target (Weeks 1-16) to opposing receivers on the year. All of the stats regarding Edelman’s usage in New England this season are in his favor — as is his recent playoff history with the Patriots. 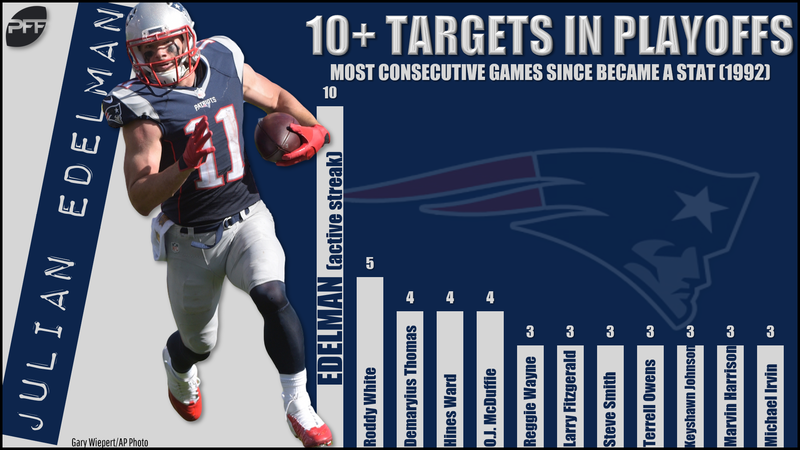 Since the 2013 playoffs (11 games for Edelman), he’s averaging 12.6 targets, 8.1 receptions, and exactly 100 yards per game (with six touchdowns as well). This week, he has the best individual WR/CB matchup of New England’s receivers against Chiefs slot man Kendall Fuller. Kelce, currently riding a historic streak, is clearly the top tight end play on the board by nearly every calculation. The only argument against him will be ownership, which will undoubtedly be high.